China's Ambassador to Canada Lu Shaye is shown at the Embassy of the People's Republic of China in Canada, in Ottawa on Thursday, June 29, 2017. 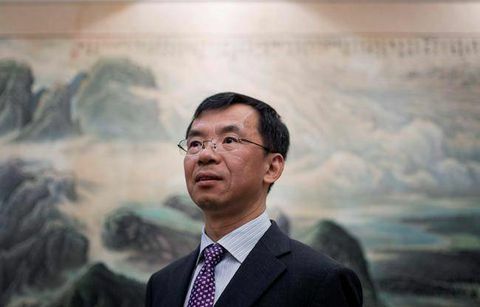 Mr. Lu has made it clear that Beijing does not want Canada to conduct national security reviews of Chinese takeovers, calling it a form of protectionism. In contrast, the U.S. report says Washington needs to be vigilant as China expands investments in new technology and industries around the world such as robotics, artificial intelligence, information communications, biotechnology and agriculture. "These investments lead to the transfer of valuable U.S. assets, intellectual property and technology to China, presenting potential risks to critical U.S. economic and national security interests," the report says. Chinese investment in the United States has risen dramatically over the past half-decade, it notes. On a cumulative basis, the amount invested in key sectors rose to $46.2-billion (U.S.) in 2016 from $4.6-billion in 2010. Meanwhile, Chinese foreign direct investment in Canada totalled $5.2-billion (Canadian) in 2016, down from $10.2-billion in 2010, according to the University of Alberta's China Institute. The congressional commission says China's authoritarian Communist Party exercises enormous influence over all Chinese corporations – whether they are state-owned or privately run. "Some private Chinese companies operating in strategic sectors are private only in name, with the Chinese government using an array of measures, including financial support and other incentives as well as coercion, to influence private business decisions and achieve state goals," the report says. Some Chinese firms even seek to obscure their dealings in the United States through the use of U.S.-based shell companies or try to drive down the value of U.S. assets through sophisticated cyberespionage campaigns and then acquire the firms, the report says. National security agencies in both Canada and the United States have warned that companies owned or partly owned by the Chinese government are not merely profit-seeking operations; they are also prone to passing on information or technology to Beijing and making business decisions that could conflict with Canadian interests but serve the agenda of the Communist Party of China. The commission warns that China is increasingly closing its economy to foreigners – even as it leverages the openness of the United States and other market-based economies. "As new laws come into effect choking off the ability of foreign companies to access and transfer vital business intelligence across China's borders, malicious Chinese actors engage in cyber-enabled theft of foreign intellectual property," the report says. "Large and lucrative portions of China's economy, including many high-tech sectors and financial sectors, are closed to foreign firms." The commission says Congress must update its foreign-investment review laws to ban Chinese state-owned or state-controlled firms from buying U.S. companies. It is calling for a mandatory review of any transaction that would give a Chinese firm controlling interest in a U.S. asset. It also recommends prohibiting any acquisition or investment that would "confer control with regard to critical technologies or infrastructure." The commission also says any proposed purchase of a media property by a Chinese entity should be reviewed to ensure it will not be used to influence U.S. public opinion and promote Chinese Communist Party propaganda. Canada has similar legislation, but it is far weaker than what the U.S. commission is proposing. The Investment Canada Act requires a net benefit test for any foreign takeover valued at $1-billion or more. This entails a standard security analysis, but the cabinet can order a much more thorough national security review that would analyze the potential impact on Canada's defence and security interests and investigate the transfer of proprietary technology outside Canada. China's ambassador to Canada, Lu Shaye, has made it clear that Beijing does not want Canada to conduct national security reviews of Chinese takeovers, calling it a form of protectionism. Since the Trudeau Liberals came to power, they have allowed a number of Chinese takeovers of Canadian companies without security reviews. In March, the cabinet reversed a decision by the former government to block the sale of Montreal-based ITF Technologies to O-Net Communications of Hong Kong. Canada's spy agency had recommended against the sale because it would give China access to "advanced military laser technology." In June, despite security concerns raised in Washington, the government allowed the sale of Vancouver-based Norsat International Inc. to Chinese telecom giant Hytera Communications. Ottawa did not ask its security officials to conduct an official national security review – even though Norsat sells satellite communications equipment to the U.S. military, and Hytera has business dealings with China's security agencies. Ottawa also approved the sale of a large retirement home chain in British Columbia to Anbang, one of the biggest Chinese firms pursuing high-profile overseas acquisitions and investments. The government later said the deal would go through despite the fact Anbang CEO Wu Xiaohui was detained by authorities without explanation. Last month, CCCC International Holding Ltd., a state-owned company, purchased Aecon Group Inc., a Canadian construction firm that has created landmarks such as the CN Tower and has done work on military bases, universities and the Darlington Nuclear Generating Station, for $1.5-billion. Ottawa has yet to say if it plans to conduct a separate national security review of the deal in addition to the standard review required by the Investment Canada Act. CCCC International has been banned from bidding on World Bank construction projects for its role in a bid-rigging scheme in the Philippines. It also helped China assert its sovereignty in the disputed South China Sea by building islands there.